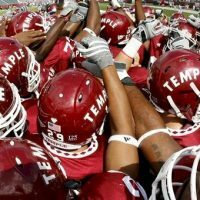 In a blow out 49-6 win against the ECU Pirates, 6 different Temple players scored touchdowns. Anchors Vince Coll and Dan Bartels take a look at the highlights before turning it over to Geoff Collins’ weekly press conference at Edberg-Olson Hall. While the offense was explosive on Saturday, non-offensive touchdowns have been scored during every game so far this season. John Press has more on the Owls’ versatility as the team is ranked first in the AAC in points scored from both defense and special teams. Finally, Vince and Dan look ahead to next week’s game against Navy and talk about Temple’s chances of going to a Bowl game this year.